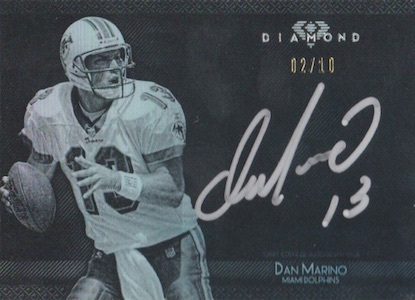 2015 Topps Diamond Football gets its name for a couple of reasons. The first is that the brand's debut comes with the card maker celebrating its 60th year of making football cards. However, to the average collector, that probably doesn't mean a lot outside of the content it brings. Which brings the second reason for the name. 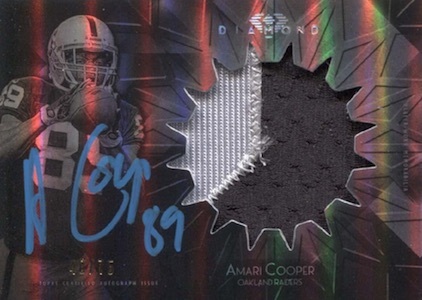 2015 Topps Diamond Football is a new ultra-premium line that delivers an autograph numbered to 10 or less, an autographed patch card and another signed card or signed patch card per box. Diamond Autographs kick things off with one per box. All are signed on-card in metallic ink and have Refractor foil images. Base versions are signed in silver and numbered to 10. Parallels include Blue Diamond (#/5), Gold Diamond (1/1) and Gold Inscription (1/1). The checklist includes a mix of veterans, rookies and retired players. 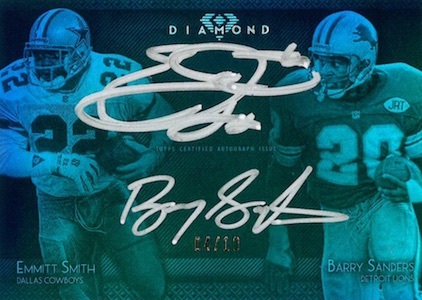 Dual Diamond Autographs take a similar approach but with two on-card signatures. Like single-signed cards, base versions are numbered to 10. The only parallels are Gold Diamond (1/1). Diamond Autograph Patch and Rookie Autograph Jumbo Patch cards combine relics and on-card signatures. They also fall one per box. Both have slightly different designs, but the main elements are the same. Base versions are serial numbered and signed in silver ink. Parallels include Blue Diamond, Violet Diamond (#/25), Green Diamond (#/10), Gold Diamond (1/1) and Gold Inscription (1/1). Rookie Autograph Jumbo Patch cards, which have swatches from the NFLPA Rookie Premiere, also have one-of-one Gold Nike Swoosh parallels. Dual Rookie Autograph Jumbo Patch Book cards (#/10) pair up the ink and relics. They are done with a horizontal format. Gold Diamond (1/1) are the only parallels. 2015 Matthew Stafford TOPPS DIAMOND BLUE 20 + SILVER 50 INK JERSEY PATCH AUTO !! Len Dawson AUTO blue ink # 5 of 2015 Topps Diamond. Super Rare HOF AUTO!!!! 2015 Topps Diamond FB RPA #RJPA-TY T.J. Yeldon Jaguars PATCH AUTO RC # 125 !!! 600 cards. Serial numbered #/10. 44 cards. Serial numbered #/150 or less. 44 cards. Serial numbered #/150. So I guess they took a great looking product of Black and Gold and an awful looking product Fire to make a mediocre product of Diamond and because it’s Topps and the year of ultra overpriced boxes it’ll be marketed at prices only group breakers can afford. What is happening to my hobby three cards for $$$$$$$$$? 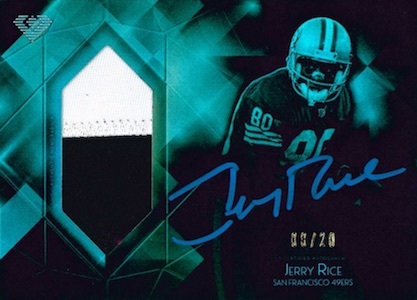 Will this possibly be Topps last NFL release…and if so will it bring the value up because of that reason? I Think all the 2015 topps football products are definitely worth collecting…I remember Fleer took a long layoff from the nba and look what happened there..
2015 topps supreme football is a great example of topps stuffing boxes with huge hits…knowing this is the end of there nfl era..hope Diamonds release is as jampacked full of high number hits(10 or less)..
Spendy but I love the vibrant autos and great patches. I can’t seem to find my card on here but I like the set and a good way for topps to go out. Scott Williams � Which card are you not able to find? I like the product. Picked up one box and got a 1/1. I got a redemption which I didn’t like. The top card was bent a bit. Might be a little bit too “hit or miss” to warrant $250 a box for 3 cards. That being said, I recently participated in a box break, winning a Jim Kelly patch auto /50 and a mean Joe Greene Diamond auto /10. The 2nd card, which I did not win was a Kevin White purple ink auto /25. All the autos are in nice ink texture and on card. To be fair, I have seen a couple of real stinker boxes broken, but overall when you get some nice names the product more than pays for itself. Shawn � If you are talking about the base Autographed Patch for Tannehill, those are going to be numbered. It could be as high as 150 based on what I have seen but all these have a limited print run. Since it is a redemption, you should be able to find a decent deal. I see a few base versions of that redemption (plus a few of the parallels) on a regular auction. I would keep an eye on those as it is your best chance to get a lower price without haggling. For reference, the only one to sell is a Blue parallel (#/20) and it went for $22.50. My box was weak! Mike Singletary 4/10 silver ink base auto. Redemptions for the other 2 autos. One, a gold parallel 1/1 auto of Ickey Woods!!???? I can’t believe he’s autographing for $275 boxes of cards. And the best was a Sammy Watkins redemption for an of /25 blue diamond parallel patch card. At $90 a card, ya think they could do better than Ickey Woods & Mike Singletary. Cory- I’d be interested in that Ickey if the price is right!! Really enjoy this product! I may be a bit biased since I pulled the Mariota rookie jumbo patch auto gold diamond parallel! Anybody have any inkling if it will come with a logo patch and/or a potential price?! Any help would be greatly appreciated!! I recently purchased two boxes of diamond football from Dave and Adams card world. Maybe I got lucky because the first box i got Barry Sanders violet patch auto numbered to 10 then a Leonard Williams rookie patch auto numbered to 125, then I got a redemption of Terry Bradshaw, Joe Greene dual auto numbered to 10. The second box i got rookie Kevin white auto numbered to 10 also jeremy Langford logo patch auto numbered to 125 and then redemption green auto patch card of John elway numbered to 5. 2015 Topps Diamond Football Hobby Box - Factory Sealed!